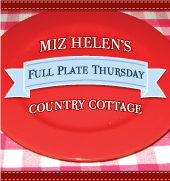 Welcome to Full Plate Thursday! I am so excited that you could come to the country today. We are going to have our morning activities out by the garden because it is such a beautiful day. It is so nice to get outside. We had some really great cooks stop by last week and we had so much fun. I look forward to seeing what you have brought to share with us today and sure hope you will come back to see us next week. Thank you, Miz Helen, for hosting. I really look forward to this. Goodness, everything looks delectable! Thanks for hosting!! Those donuts are so tempting. Hi Miz Helen! Today I am sharing my recipe for Chicken Cacciatore. It is a re-creation of my Mom's old recipe which I have always loved. It has a few peperoncini peppers in it which gives it a nice little zing! I linked up a recipe for Sweet Potato Coconut Soup. Thanks so much for hosting. I love seeing all the recipes. Morning Miz Helen, I brought pancakes this week =) Thanks so much for hosting this fun event! Wow I happened to be blog hopping. You have some really yummy looking recipes! Thanks again for hosting every Thursday. PS. I am having a giveaway. I hope you can stop by. Hello Miz Helen, linking an older post on jam sweetened quick bread and a link on how to make homemade Melba Toast Crackers. Thanks for hosting. Love all of your tasty treats here! Thanks! Thanks for hosting! You have such a beautiful site. So many yummy recipes shared today. Thanks again for hosting! I love Full Plate Thursday! I look forward to all the wonderful dishes (and sites) I get to see each week and to the wonderful hostess, Miz Helen! Such a varied assortment of beautiful dishes! I love it! The plate I brought has an easy appetizer or snack made healthy and also economically -- Redksin 'Skins. My husband likes Ranch Dip for them, but they could also have hummus or dill dip or whatever your favorite is. Thanks a million for featuring my BREAKFAST BAKE! Thanks so much for hosting another great round-up of dishes. I m off to explore now. Cheers! Thank you for hosting Miz Helen! I've brought my Haddock with Guacamole Rice today. As always, thanks for hosting, Miz Helen! Thanks for featuring my Greek Chicken. And as always thanks for hosting. Linking up with Slow Cooker Honey Chipotle Pulled Pork this week. Thanks for featuring my Texas Fudge Brownies! This week it's oatmeal butterscotch cookies! Thanks so much for the feature:) That's awesome. I'm excited to have a seat at your table. Thanks for hosting Miz Helen! and I must say you are so gracious to visit my post that I link up each week! Thanks for checking us out too!!! You are too gracious!!! I love Thursdays just because of this. Thanks! Thank you for inviting me! I am following and sporting the button. Thank you so much for featuring my Vanilla Pear Bread in this week's Full Plate Thursday menu! That recipe, along with my Fresh Baked Mexican Cornbread, are currently in the running for a Best Of February 2011 prize at the Saturday Morning blog. If you would consider voting for my recipes, I would be SO appreciative! The link to my post with the details is below. Hi Miz Helen-You have quite a list of contributors. Such a nice event you are hosting. Also on the Linky, all those talented food bloggers linking their delicious creations. I will check them out...really looking forward to their posts, and recipes! Hi Miz Helen, I've just linked up a cold refreshing dessert! Thank you for hosting!